After 50+ years of running the Denver Folklore Center, which he founded in 1962, Colorado Hall of Fame Inductee (2012) Harry Tuft is pursuing his original dream of making music. 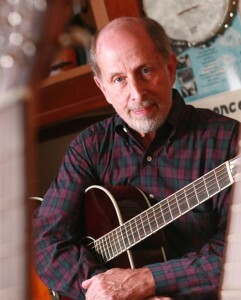 Accompanied by Rich Moore and special guests, Mr. Tuft will be singing and picking his guitar for an evening of folk, country, R&B, and his favorites from “Great American Songbook.” Music Appreciation Society invites you, your family and friends to celebrate and acknowledge the godfather of the Denver folk community, Harry Tuft, in a rare live performance on Saturday, November 12. Harry Tuft is a household name in the Denver folk community and to have him perform at Baur’s is truly an honor. Purchase your tickets today to be part of this authentic night of Denver folk music!